Let’s talk about steering and suspension in your vehicle. These are two closely related elements that contribute so much to your vehicle’s handling and comfort when you’re on the road. When you feel like you have good, steady control in your steering and a solid, smooth ride, it feels safe. When, however, it’s tough to turn the wheel, or if you don’t trust the accuracy of the turn of your steering wheel, that can feel scary. If you’re having trouble steering, or if it seems like you are feeling every little rock or tiny bend in the road, consider asking about your suspension or steering when you’re next in the shop. We’ll have a technician test drive your car with you, and we’ll make sure all is running smooth and right in your vehicle….with you. When you’re ready, schedule your next service with Tom’s Automotive. We’re definitely ready for you and your vehicle. How smooth is your ride? Your shocks and struts might need some attention! 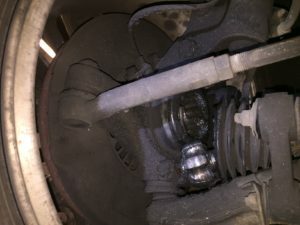 This is a picture of a broken CV joint on a Subaru. If you hear clicking noises while turning don’t drive too long or this can happen to you and you’d have to be towed in! This is something we inspect with every oil service to ensure that you are safe.